They’re taking adventure to new lengths. Rapunzel (Moore) has lived her whole life locked in a tower, away from the real world by her wicked mother (Murphy). Her one dream is watch the lanterns that litter the sky every year on her birthday and she thinks she will never get the opportunity to do so…that is until a runaway thief (Levi) discovers her hiding place and begins to show her the real world. Based on the original fairy tale by the Brothers Grimm, this re-imagining gives a new twist on the famous tale. 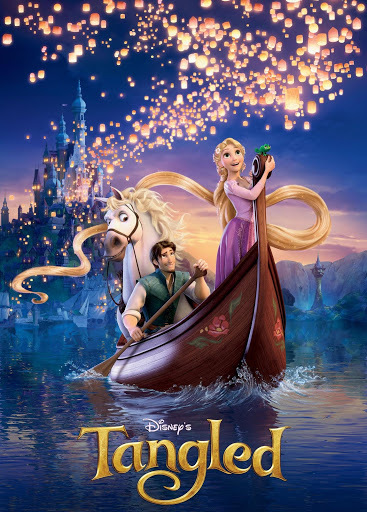 Taken in the typical Disney style – with a handsome – albeit animated – hero, beautiful girl trapped by evil relative – it’s the usual family flick. But just like any other Disney flick, it is filled with witty one liners and the usual fairy tale romance. And as usual, there’s the usual adorable animals. Pascal, the amazingly cute, easily embarrassed chameleon is the cutest animated animal I have ever seen! This lovely little creature gets so many laughs as well as a lot of “aww”-ing because after all, he is very cute. The usual family friendly Disney film but it lives up to the best of them but with an unexpected twist.